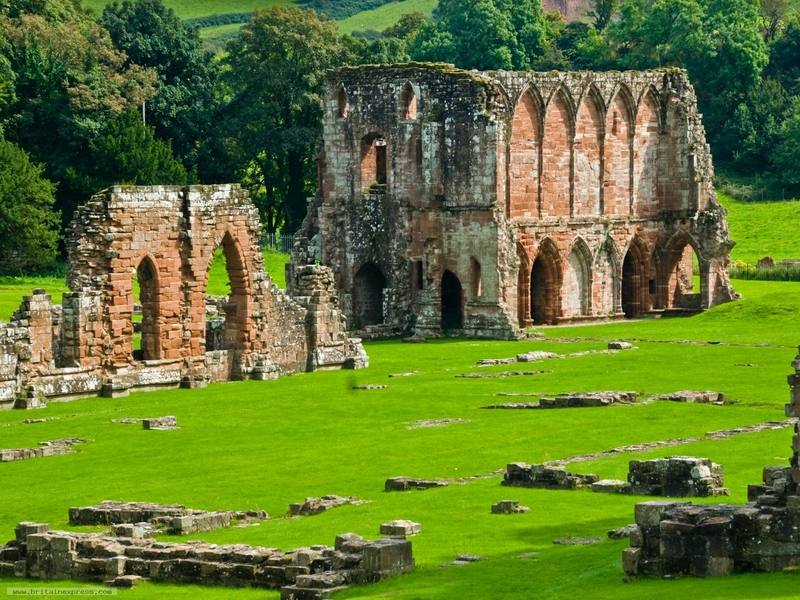 The 12th century Furness Abbey in south Cumbria has been in ruins since 1537 when it was disestablished, looted and destroyed by Henry VIII. Large cracks began appearing in the walls of the presbytery in the early 20th century, and English Heritage is currently funding an extensive project of exploration and restoration with the ultimate aim of underpinning the structure to keep it from collapse. They plan to install massive concrete rafts deep into the ground on top of which a steel framework will be built to brace and anchor the walls. To prepare for the concrete rafts, Oxford Archaeology North was contracted to excavate four deep holes, two north of the presbytery on the site of the abbey cemetery and two inside the presbytery. As expected, a number of graves, all of them disturbed over the centuries, were found during the cemetery excavation. When they moved inside, just 13 feet (four meters) northwest of the high altar they discovered the undisturbed grave of a medieval abbot, still wearing his ecclesiastical ring on his finger and holding his crozier, the staff of office shaped like a shepherd’s crook. This find was not at all expected. The abbey was looted thoroughly after the Dissolution; it was thoroughly dug up by archaeologists in the late 19th century, and it was even more thoroughly and deeply dug up in the last century during work to shore up the failing foundations. Finding an undisturbed grave would have been shocking in and of itself, never mind one of an ancient monastic leader still wearing his accouterments. It’s also of major historical significance because this is the first intact abbot’s grave discovered and excavated under modern archaeological conditions. 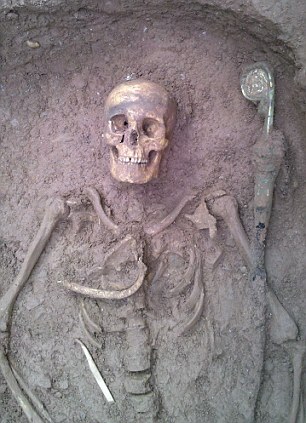 An initial examination of his skeleton, which is currently in the care of Oxford Archaeology North, indicated that he was probably between 40 and 50 years old when he died. Like many monastic burials of middle-aged and older men, he had a pathological condition of the spine often considered to be associated with obesity and mature-onset (Type II) diabetes. The grave – which could date to as early as the 1150’s – also included the decorated crozier and a gemstone ring. The grave was situated in the presbytery, the most prestigious position in the church and generally reserved for the richest benefactors. Most Cistercian abbots were buried in the chapter house. 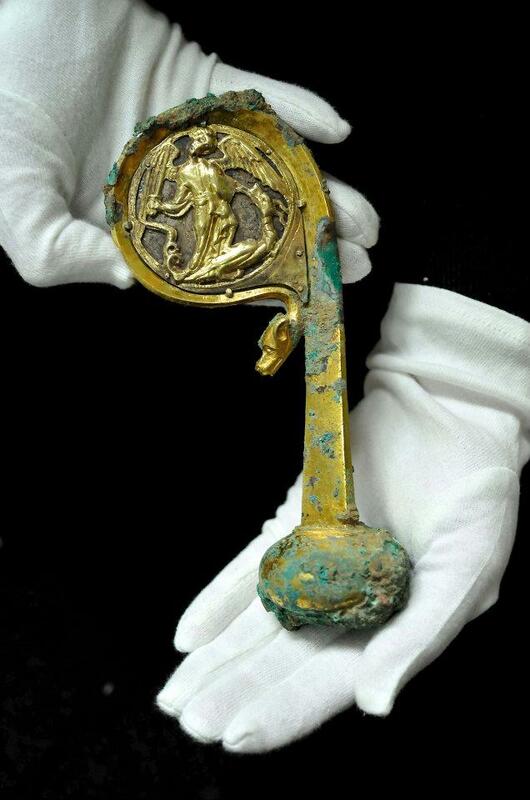 The crozier is made of gilded copper and on the inside of the loop has a depiction of the Archangel Michael defeating a dragon. The end of the crook is shaped like the head of a serpent (looks like a dog to me). A small piece of the wooden staff which the crozier capped has survived, as have the pointed iron spike that was at its base and some fragments of the linen and silk cloth used to keep the abbot from sweating all over the wood as he held the staff. The ring is gilded silver with a clear gem or crystal. 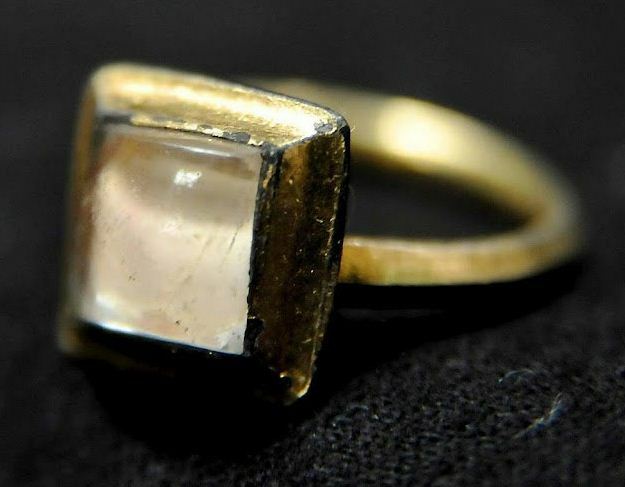 There’s a hollow behind the stone — perhaps used to store a holy relic — and the inside of the bezel where the ring touched the top of the finger comes to a point. Abbots in the 12th century were supposed to eschew the kind of ornamentation common among the princes of the Church. They even had to get special permission to wear an ecclesiastical ring. The pointed ring, which doubtless caused its wearer some amount of irritation and pain, may thus have served double duty as insignia of authority and as mortifier of the flesh. Certainly the abbot was devout. The arthritis in his knees bears mute witness to many hours spent in prayer. Radiocarbon dating is ongoing. Until we have the results we can’t know who this man was. Should the results come back within a few decades’ range, it should be possible to pinpoint the abbot based on the information we have from his burial. He might not be an abbot at all. Bishop William Russell from the Isle of Man was buried in Furness Abbey in 1374. He would have had and been buried with a crozier and episcopal ring. The crozier and ring will go on display at Furness Abbey for just a few days, from Friday, May 4th until Monday, May 7th.